While food demand and turnover in the United Kingdom remained robust in 2017, challenges for the industry have mounted due to its heavy reliance on imports (in 2016, 48% of food consumed in the United Kingdom was imported). The pound sterling devaluation since the June 2016 Brexit decision (about 15% against the euro) has increased the costs of commodities and food items for many British food producers and processors reliant on imports, raising their input costs and negatively affecting their margins. Given the market power of major retailers and the ongoing price wars in the food retail segment, food businesses along the supply chain have faced major difficulties in passing on those price increases. Leverage against retailers is limited by the fact that the food producer segment is dominated by small and medium-sized players in a highly fragmented market. While the initial effects of raw material price increases was partly cushioned by forward contracts and hedging mechanisms, food price inflation has increased in the course of 2017, and this trend expected to continue in 2018 as major retailers will try to pass on the increased costs to consumers. Higher import prices have increased the pressure in an already highly competitive market, in which food producers and processors are driven to accept low or diminishing margins in order to retain relationships with their customers. In some cases this is destabilising businesses which accept contracts on poorer terms. We have already seen several instances of price erosion due to competitive tenders with contracts being secured in order to maintain volumes just to cover overhead, which is not sustainable in the long-term. 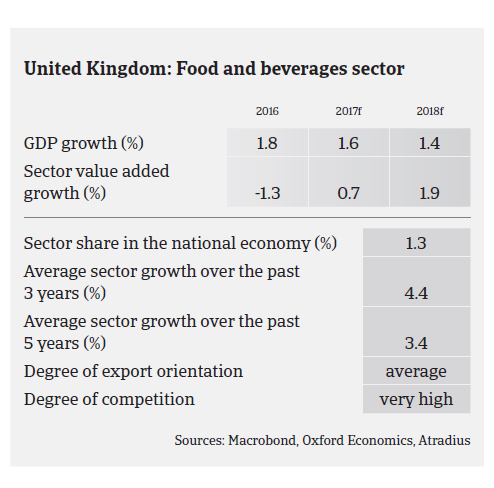 At the same time, export-driven food businesses benefit from the pound sterling depreciation - especially in the beverage segment, which is the only subsector that shows a positive trade balance (mainly due to whisky exports). Margin pressure and the weakness of the pound sterling have triggered a high level of M&A activity in 2017. Despite increased uncertainties after the Brexit decision British assets have remained attractive to foreign investors, and this is expected to continue in 2018. 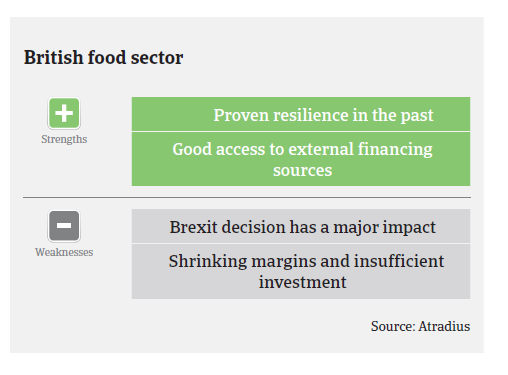 However, at the same time we observed that food businesses remain reluctant to invest, waiting for more clarity on the outcome of Brexit negotiations. Payments in the British food sector take between 45 and 60 days on average, and payment experience has been generally good over the past two years. However, due to inability to absorb higher input costs and increased pressure on margins, both payment delays and insolvencies have increased this year. We expect this increase to continue in the first half of 2018, with food business failures rising up to 5%, as the uncertainty around Brexit and its implications for cross border trade linger on (mainly concerning Ireland as the main trading partner on food). Some larger players continue to push the supply chain on price and longer payment terms, adding cash flow challenges to mainly smaller food businesses. It is expected that in a hard Brexit scenario the effect of the subsequent application of WTO tariffs on a low margin food sector would be profound. That said, the British food sector has a proven history of navigating periods of lower profitability through stringent cost control measures, and there is still the chance that much needed price increases will be secured, leading to a potential improvement in profitability across the sector. The outcome of pricing negotiations, mainly between retailers and food producers, will largely determine the future non-payment and insolvency development in the sector. We expect retailers to increasingly pass on costs to consumers in 2018 in order to alleviate their own margin pressures. Despite the current troubles, access to external financing (e.g. bank loans) is still not restricted for food businesses, and asset backed lending facilities are extensively used in the sector. 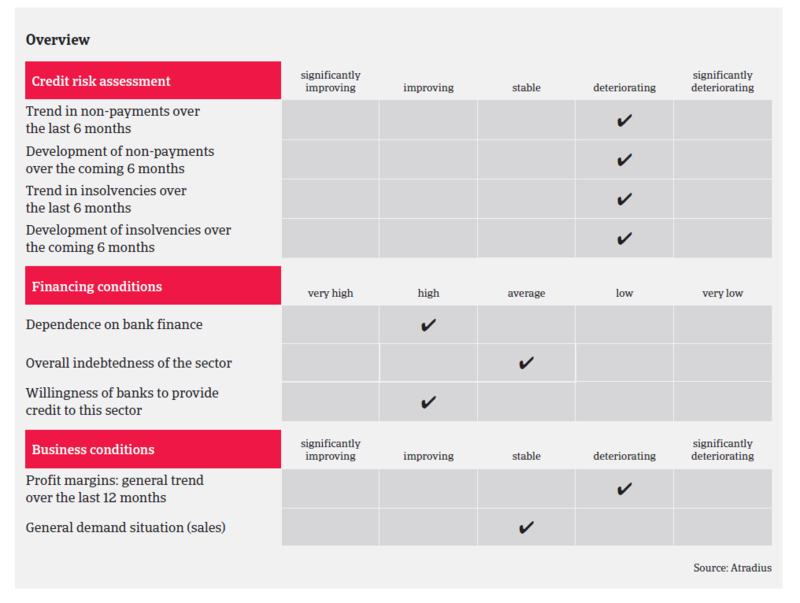 For the time being, our underwriting stance remains generally open to neutral. Due to our extensive contacts across the industry an acceptable risk acceptance is anticipated, as we remain very close to the developments in the industry and vigilant to changing dynamics and challenges throughout the food supply chain. Our underwriting stance remains generally open for food retail, which mainly consists of strong players. The same accounts for the dairy sector which, despite some ongoing challenges, has shown an improved performance in 2017. That said, we are more cautious with the meat and the fruit/vegetables segments, as both subsectors are highly dependent on imports, therefore experiencing elevated levels of input cost inflation and profit margin erosion. This is expected to continue as long as the exchange rate remains weak. Both short firm fraud and impersonation fraud are ongoing issues in the British food industry, mainly in the meat and fruit/vegetables subsectors. We have observed a marked increase in impersonation fraud cases in 2017, with overseas suppliers in particular being targeted. Profit margins of British chemicals businesses could be negatively affected by domestic economic uncertainty over the outcome of the Brexit negotiations. Demand from construction and automotive as key buyer sectors has been robust in 2017, and steel price increases have been pushed through the supply chain. ICT growth is expected to slow down in 2017 as increased economic uncertainty is affecting household consumption growth and business investments.